Palpation is the first technique! A Massage Therapist must not only know the musculoskeletal anatomy; he/she must also know how it's supposed to feel. By following the body along and across the muscle fibers tells the therapist a story. How free is your horses "body suite"/ The fascial (skin) tension is the key to a successful recovery. In healing from injury the fascia tightens and if it doesn't release, ROM will be limited. "The 3 S's" ~ Stretch... Strengthen... Supple! Full Extension of the Shoulder! This Photo illustrates full shoulder extension; note there are no broken angles to the limb when this stretch is at it's fullest point. The shoulder blade, shoulder joint, knee & fetlock all line up to create this fabulous stretch for your horse. Especially great in lengthening the muscles under the saddle (Latisimus Dorsi Muscle) and Triceps Muscles. The power of this stretch is substantial yet even the therapist can loose grip! You can have Movement With & Without Good Bio-mechanics! A balanced horse can maintain good muscle tone just by living their day-to-day routine...Make every step count! Good Bio-mechanics + Movement = STRENGTH! No Hoof ~ No Horse! 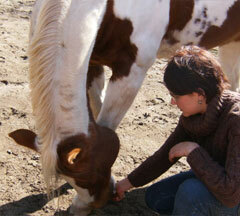 Although the major areas of locomotion are in the musculoskeletal system of the horse. 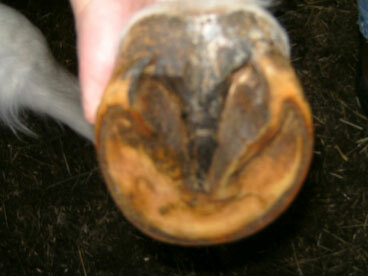 One of the leading causes of lameness is an imbalancement of the hoof. This Hoof is NOT BALANCED! Increased weight bearing on the lateral Hoof Wall. With this stretch we are looking to bring the nose to the center of the chest. When the nose reaches the center of the chest raise the treat upward. This strengthens the Trapezius Muscle! From the center of chest move treat across between each point of shoulder. This supples the poll! Softening into the bridle, Starts at the poll! 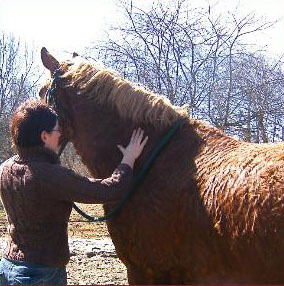 The use of a treat helps you to position the horses head correctly. You want the head/cheek to mirror the body! If your horse can't reach these points give it time. 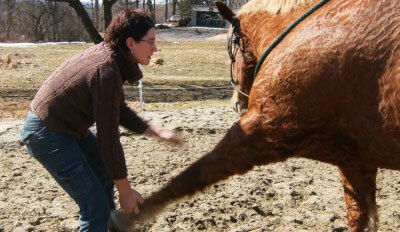 If your horse seems very quick to bite the treat and return to center again there may be tightness or soreness. Try not to go as far and ask the horse to hold where they are comfortable. 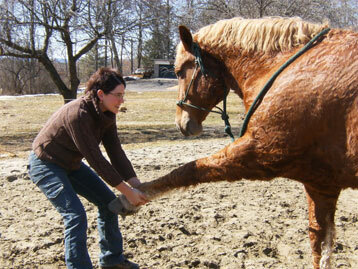 Using the treat, ask the horse to hold the stretch a few seconds before releasing. Watch that the horse doesn't buckle or bend at the knee; as that would be cheating!! The opposite side of the horses cheek should be lateral & parallel to the limb for maximum benefit! Elbow Flexion is a great Stretch for the Triceps Muscle. As most horses don't naturally have high knee action. 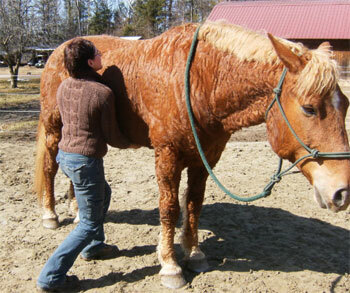 Passively bending the Elbow Joint opens the muscle fibers of the Triceps muscle; this muscle is always in contraction when a horse is standing!!! Most important is to support the limb. 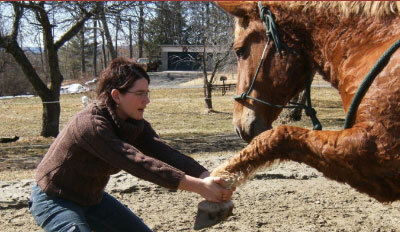 If the horse doesn't trust that you'll hold them they will decrease their performance during assisted stretching. We're looking for the final thrust! where the scapula drops/lowers forward towards the ground, lengthening the limb sometimes almost another 1-foot! When they finally give the limb...the horse usually lowers their head and neck in a relaxed manner. Hind-Limb Flexion is a great Stretch for the Hamstring muscles & Gluteal muscle. This stretch will help your horse to better track-up. Will increase propulsion at the canter. Hind-Limb Extension is a great Stretch for the Quadriceps muscle. Thus enhancing your horses Suspension! This Stretches the Top-Line & Strengthens the Abdominals! Add this to your tack-up routine and see a difference in your horses top-line within days!! Once elevated hold for 30 seconds then release. Repeat 2-3 times. The Catback is a Stretch for the Low Back & Pelvis! It also Strengthens the Psoas & Abdominal Muscles! Lumbar Stretch & Abdominal Strength All~in~One! 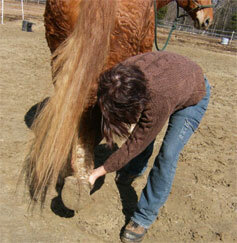 Your horse's day-to-day routine can be a part of his/her strengthening program! 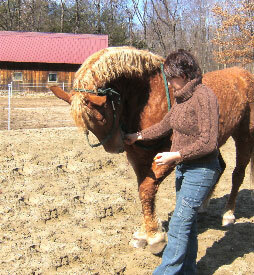 Only a few repetitions of a new movement or exercise, when done correctly, will help your horse to build new strength. Depending on your horse's weakness, will vary the exercises performed to re-strengthen. Change your Range can help you to determine what exercises would be beneficial for your horses program. So even if your horse isn't lame, adding these stretches & exercises into your routine can greatly enhance your horses future. These preventive measures can help keep your horse in the game & out of retirement! 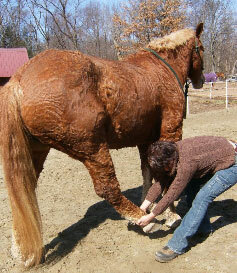 Help to rehab your horse from a previous injury!